If you want your product content to work for you (rather than the other way around), you need a content strategy. In fact, you probably need a Unified Content Strategy -- a three-pronged approach that empowers you to do just about anything with your product content. 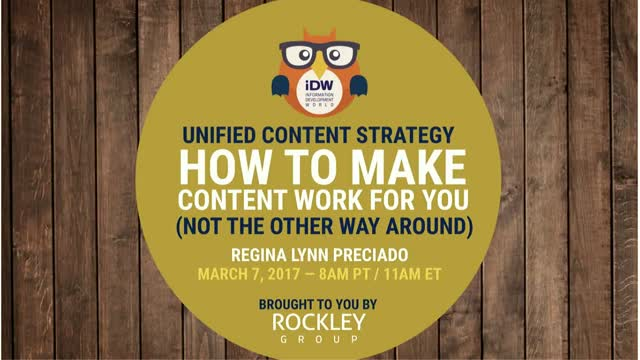 Join me, Scott Abel, The Content Wrangler, for a free, one-hour webinar with content strategy maven, Regina Lynn Preciado. Regina will discuss the need for a flexible, forward-looking content strategy. You'll learn what a Unified Content Strategy is, why it’s important, and five things you can do to start working toward a more strategic approach to product content. Regina Lynn Preciado is a content strategy consultant who helps companies transform how they organize, manage, and leverage content. From the dot-com boom of the ‘90s to today’s demand for intelligent, global, mobile-friendly content, Regina has helped dozens of organizations make content work for people (instead of the other way around). Regina is a senior consultant with Content Rules, Inc., the only licensed provider of The Rockley Method™ unified content strategy. After years of promises and hype, artificial intelligence has finally reached the stage where it is impacting our lives on a daily basis. The things that computers can do with us and for us is rapidly expanding. This live webinar will provide an overview of how artificial neural networks are changing marketing. * What are artificial neural networks and deep learning? How do they work? * Where are artificial neural networks used today? * What do artificial neural networks mean for marketers? The key to providing a great customer experience is having great content. Content optimization is about making sure your content performs at its best. Content sells, describes, and evangelizes your product or service. In many cases, it is your product or service. Val will help you identify which content optimization stage you are in and how to take your content to the next level. Get your questions ready and we hope to see you there! This webinar introduces the basics of structured authoring. We will discuss what structured authoring is, how it differs from unstructured writing, the tools you need to support it, and more. If you don’t know what structured authoring is, or if you have lingering questions about the topic, this webinar is for you. With the continued development of natural language processing (NLP), there are more software applications, doing more types of editing, than ever before. We will cover how an NLP works, editing tasks best done by a machine, and instances where only a trained human editor will really get the job done. * What is a natural language processor and how does it work? * What types of editing are done best by an NLP? * What types of editing are best saved for people? Join subject matter expert, Val Swisher, for a highly illuminating and thought-provoking exploration into artificial intelligence (AI) and its potential impact on the future of content. * How, at its heart, AI is a sophisticated natural language processor. * The synergy between content management/taxonomies and training AI natural linguistic patterning. * How content management is critical to AI effectiveness in data mining dark content and determining future applications such as virtual agents and chatbots. Technical communication professionals revolutionized the publishing world with the introduction of structured writing and intelligent content. By adopting innovative methods, approaches, and content standards, we were able to craft and deliver content to multiple channels quickly, often with reduced effort and cost. And, we’re not done yet. When technical content is required for global audiences, intelligent content alone is not enough to tackle the obstacles multilingual content introduces. Combining structured intelligent technical content, terminology management, and translation memory together can solve these challenges. We call this the Holy Trifecta of Intelligent Technical Content. When all three of these are leveraged together, we can produce consistent content that is on-brand, on-message, and easy to read in every language. You bought the content management system, you migrated your content into it, and you might even have implemented DITA. So why is your content management such a mess? Content management projects have a way of sprawling into content un-management, especially if your organization started with a system but did not have a strategy. There are several areas in which content management can become content “manglement.” The good news is, you’re already thinking in terms of managing your content, and chances are you can get things back on track. Join me, Scott Abel, The Content Wrangler, for this free, one-hour webinar along with my special guest, Regina Preciado, a content strategy consultant who helps companies transform how they organize, manage, and leverage content. Regina will take a look at what went wrong—and help you come away with a plan for diagnosing your specific content management issues, and how to start treatment. Regina will talk about where things are most likely to get messy; how to figure out what’s really gone wrong—it’s (probably) not “everything,” and the steps you can take immediately to diagnose—and start treating—your specific content situation. Changing regulatory requirements, combined with increasing content volumes and channels, and antiquated processes have sharply increased costs and risks for medical device manufacturers. Estimates put the industry’s total “cost of content” at over $3 Billion world-wide—not including the costs of compliance risk. Now, solutions built on structured content and process automation technologies are delivering a 30-40% cost and turnaround reduction (and 50% reduction in risk) for manufacturers such as GE Healthcare and Stryker. Join me, Scott Abel, The Content Wrangler, for a discussion with Marc Miller of Transperfect Medical Device Solutions, about where content costs and risks may be hiding in your medical device content production process. Marc will discuss the technologies that can help you manage the challenges, and he will talk briefly about the strategies you’ll need to employ in order to take advantage of the next wave of content technology innovation. Governance is not a ‘four-letter word,’ but in many organizations, it is often regarded as such. It’s viewed as restrictive, and therefore reducing the ability of the content creator be creative. It’s seen as slowing down the creative process and introducing unnecessary roadblocks to producing content. In reality, it provides clarity to everyone in the content creation cycle, improves content quality, and reduces risk. Join Scott Abel, The Content Wrangler, and Charles Cooper, VP of The Rockley Group, for this free one-hour webinar. In this session, Charles will explain the need for governance when creating content for a regulated industry, explain how governance can streamline the process for content creators, and identify the benefits of introducing the “right amount” of governance. Harmonization of medical device content involves reusing existing content within and across product families. The concept of reuse is fairly straightforward, but not in a regulated environment. Content is approved for a particular device so you can’t just change the content as desired. Join Scott Abel, The Content Wrangler, and Ann Rockley, President of The Rockley Group, for this free one-hour webinar. In this session, Ann will discuss how to address the challenges of content harmonization including regulatory requirements and approvals, translation, and cultural change. Many organizations underestimate the importance of linguistic consistency. Ensuring consistency is critical, especially when a company is attempting to communicate to prospects and customers around the globe. Linguistic inconsistencies in corporate and product content can damage reputation, create confusion, trigger compliance problems and more. There are five best-practice steps that you can take to mitigate linguistic risk while also lowering costs for support and reducing the need for damage control. These best practices also help lower the cost of translation. Join me, Scott Abel, The Content Wrangler, and my guest, localization expert, Richard Sikes, for a free, one-hour webinar examining these five steps in detail. You’ll learn why terminology management should be part of every global content strategy. You'll discover how the five steps can help you formulate a terminology management strategy, and you'll understand the role maturity and sophistication play in ensuring you terminology management project is a big success. Challenges are mounting to bring everyone into the same conversation—the one with your customers. As digital and real-world experiences collide and compete, it has never been more important to speak with a unified, personal voice in the language of your audience. Transforming how we communicate from vicious to virtuous circles requires globalization be woven into strategic and tactical efforts at every level within the organization. Join me, Scott Abel, The Content Wrangler, and my special guest, global content expert, Diana Ballard, as we examine five challenges that get in the way of global content success. You’ll learn why global content integration is a test of your business agility and determines how successful you’ll be on the international stage. Diana Ballard is B2B globalization consultant and translation/localization expert on a 30-year pursuit to unify the end-to-end information lifecycle—from design to delivery, Diana is armed with a passion for connecting with customers with content in the language of their choosing—their own. The U.S. Hispanic population reached 57 million in 2015, accounting for 17 percent of the nation’s total population. From 1990 to 2017, their purchasing power went from 0.21 to 1.7 trillion dollars. And yet, the current administration wants to throw them back over a soon-to-be-built wall. Despite their incalculable contributions to the US culture, politics, and economy, these men and women all over the country feel rejected, diminished, and abandoned by the very people who should protect them. Whether you have a humanitarian motivation, are aiming at financial goals, or are driven by a combination of both, Hispanics are ready to talk to you—right now! But can you get to their brains, touch their souls, and speak in a language that will gain their trust? Join me, Scott Abel, The Content Wrangler, and my friend and peer, translation and localization expert, Fabiano Cid, for a free, one-hour webinar. You’ll discover how understanding the fundamental distinctions between Latinos, Hispanics and Latin Americans—as well as the linguistic differences of variants of the Spanish language—can help you communicate in valuable ways. You’ll find out what things to bear in mind when generating, or translating, content for a Hispanic audience. You’ll see examples from both successful marketing campaigns—and flopped attempts. And, you’ll learn from an expert in all things Latin American how to speak to this community and win their hearts—because this is where all their decisions are made. Continuous delivery has become an umbrella term for any regular and repeatable content and product development process that has an agile approach under the engine. For some organizations, continuous delivery is cycled daily, and content gets checked in, picked up, and published every day. In other cases, the content is only published when appropriate exit criteria are met. More often than not, continuous delivery practices are driven by customer experience strategies. In simple terms, organizations want content consumers to have the right content when they need it. Evolving continuous delivery practices means progressively reducing the lag time for content time-to-market. To do this well, each content drop point has to be easy to globalize in context, source language, and the transport media. How do organizations do this? What are the current challenges with this process? And why is it important for content professionals? Join me, Scott Abel, The Content Wrangler, for this free, one-hour webinar on March 8 at 8 am PT. My guests will be Dave Ruane, Enterprise Business Development Director for EMEA at Xplanation, and Joe Gelb, President of Zoomin Software. You’ll learn why some of the world’s biggest brands are leveraging a repeatable, systematic and streamlined approach to content production that helps them drastically reduce costs and time-to-market and deliver global content continuously. You'll discover what steps you'll need to make to get started. And, you’ll have the opportunity to ask questions of the panelists. Are you confused about the many options for managing global content between your content management system, marketing automation platform, and translation technology? And most importantly, are you concerned about the impact on the user experience for both the content manager and in-country reviewer? Imagine yourself in a work environment where you can focus on everything that matters when managing global content. All the clutter is gone. No cutting and pasting of language content. No emails. No PDF reviews. No quality complaints from your in-country offices. Instead, you give all your attention to developing strategies, new product introductions, and innovating your processes. Join me, Scott Abel, The Content Wrangler, and my guest, Andrew Lawless, for a free, one-hour webinar designed to help you select the right tools to manage global content efficiently and effectively. Attendees will learn a technology selection planning exercise that provides complete clarity on how to automate global content production from end-to-end. You'll discover the key solutions for a fully automated localization process from content authoring to translation, in-context review and publishing. Equally important, you will hold in your hands a technology blueprint for success. Andrew Lawless is a best-selling author and leading consultant to US businesses that generate $2.4 trillion of revenue each year by selling their services and products abroad. Andrew teaches masters programs on localization project management at University of Maryland and launched Lawless Guides, an online learning platform that provides training to managers of international products, projects and programs. Website improvement projects are often undertaken because they come with the promise of dramatically increasing business results. The way in which we tackle these projects—and the approaches we choose to use—determine whether our efforts will yield improvements or not. Migrating web content from one system to another can be challenging. To be successful—and to get the results we seek—it’s best to start with a plan. Join me, Scott Abel, The Content Wrangler, and my guest, David Hobbs, for a free, one-hour webinar designed to help you plan for a website content migration. Attend this session to discover why web content migration planning should start from the perspective of quality. Learn why boxing—and unpacking—content can help us achieve desired results. And, find out why, unlike a house move, we often need to unpack the content during a content migration project. David Hobbs helps organizations that want higher-impact digital presences, especially those ready to take on silos and otherwise disconnected site visitor experiences. These types of complex, high-impact changes require early visioning and buy-in (a “build it and they will come” approach won’t work). David works with organizations on early strategy as well as how to achieve the content needed on the new site (including migration and rollout planning). David has a Master’s in Computer Science and started his career as a C programmer. Before the web took off, David lived in a mud hut in Chad working with trash-collection and water-distribution system community groups. Monthly live webinars and periodic videos covering topics including cotnent strategy, global content strategy, content creation, writing, illustration, and how to make sure your content is optimized for all audiences.